On behalf of Union County Board of Freeholders and Union County Government we have launched the “UC HERO” program in honor of our veterans. The initiative offers services through various county agencies, including the Office of Veterans’ Affairs, the Division on Aging, health and mental health referral services, job opportunities through the Workforce Innovation Business Center, and outreach in addition to partnering with local veteran groups in outreach efforts. UC HERO seeks to increase awareness of eligibility, entitlements, benefits programs, and services provided to veterans by various Government Agencies, including County Government. This page contains resources for Veterans at all stages of life. We hope that you find this page helpful. Please contact us if you have any questions. 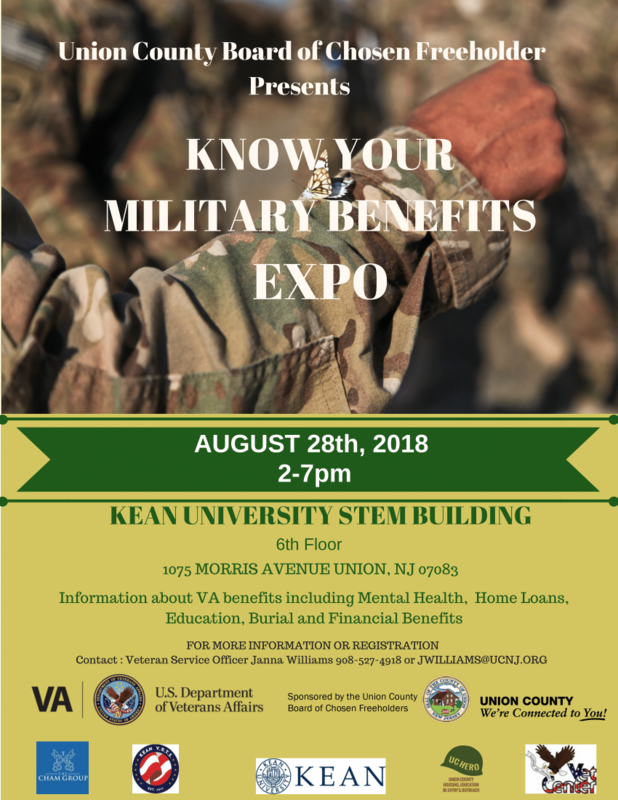 Many New Jersey Veterans are unaware of the numerous federal, state and local program benefits, entitlements and services that are available to them. Veteran Services provides advocacy, information and referral for veterans and their families on a wide variety of financial, health and issues related to VA benefits and services. Service is available through a toll-free hotline (866-640-7115) and at the office in the Union County Administration Complex in Elizabeth. The office serves as a liaison to county veterans’ groups. In addition, the office handles burial of indigent veterans and coordinates the placement of flags on all veterans’ graves each Memorial Day. Provides eligibility criteria for all veteran benefits and entitlements. Assists in securing copies of lost military documents, such as the DD-214 (military separation document). Guides applications for service connected compensation and pension claims. Helps veteran’s widow/widower and children apply for benefits. Helps with appeals for denied benefit applications as needed. Provides death and burial benefit information. Coordinates annual placement of flags on veteran graves throughout Union County during Memorial Day weekend. Information and referral to other county, state and federal government services, including housing; mental health; education; job training and placement; financial; and medical/nursing home services. Facilitates transportation (wheel chair equipped) to the VA Healthcare System at Lyons and East Orange through the Union County Paratransit system. The parked vehicle is owned by the disabled veteran or the Purple Heart recipient. The disabled veteran or Purple Heart recipient is the driver or a passenger in that vehicle. The vehicle displays a unique placard issued by the MVC. A disabled veteran or Purple Heart recipient placard affords the vehicle owner the same privileges as the license plates. An applicant for a placard must be the owner of the vehicle in which the placard is to be used, and the placard can only be used by the owner if that owner is the driver of the vehicle or a passenger in it. An application (MVC form BA-49). 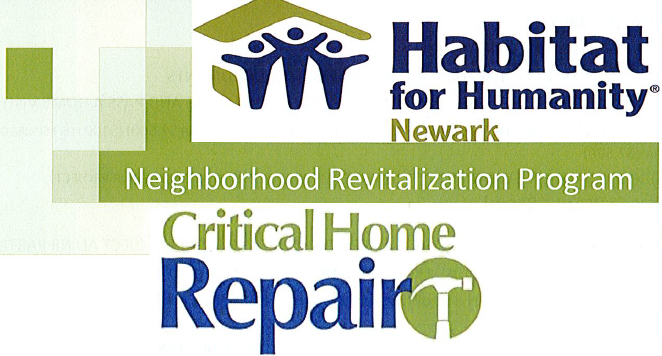 Application is available at any MVC agency, by mail, or by calling (609) 292-6500. Placards are available at any MVC agency or by mail. Placards are subject to renewal/recertification every 3 years. Placards clearly show their expiration date, which will be on the last day of the month that is punched out. The year of expiration will also be punched out. The holder of a disabled veteran or Purple Heart recipient placard can also be issued a Person with a Disability (PWAD) placard, if eligible. These unique placards do not replace a PWAD placard. The disabled veteran or Purple Heart recipient placard cannot be used for parking in PWAD labeled parking spots. Applicants who meet the requirements for both a disabled veteran and Purple Heart recipient placard must decide which type of unique placard – DV or PH – they wish to receive. Only one type of these unique placards can be issued. The holder of a unique placard will be issued a placard recipient identification card that will match the owner information on the vehicle registration card for the vehicle in use. This specific identification card indicates the actual person who is entitled to use the privilege of the unique placard. The State of New Jersey passed a $3,000 exemption for Income Tax for eligible residents meeting NJ’s veteran status. Since 1944, VA has backed over 22 million home loans for Veterans and their families. The program provides a guaranty for mortgage loans made by private lenders to eligible Veterans. The guaranty backing effectively eliminates the need for a down payment, helping Veterans afford homeownership. No other major no-down mortgage program exists in the market today, and typically around 90% of VA loans are obtained with no down payment. As of September 30, we reached the milestone of over 700,000 home loans guaranteed for the fiscal year 2016. That 700,000+ figure is the most home loans guaranteed in one fiscal year in the history of the program. VA continues to modernize the program, reducing time spent in the loan approval process while also improving the accuracy of benefit delivery, Veteran outreach and communication. These improvements have allowed VA to maximize opportunities to promote the attractiveness of the program to lenders, builders, real estate agents and most importantly to our active duty Servicemembers, Veterans, and surviving spouses. The VA Home Loan program benefit is not a one-time benefit– it’s reusable. VA loans can be obtained for up to the full appraised value of the home (100% loan-to-value). In addition, there is the potential for these loans to include up to $6,000 towards improvements for energy efficiency, AND the loan funding fee can be rolled right into the loan balance. VA waives that funding fee for Veterans who receive VA compensation benefits, those who are service-connected disabled, but serving on active-duty, or those drawing retirement pay. Some surviving spouses are also exempt from the funding fee. We are proud to say that our VA Home Loan program can also help Veterans who are current homeowners. Many borrowers are now looking to take advantage of historically low interest rates to refinance their homes. Just 5 years ago, the average interest rate for a 30-year fixed mortgage was 6%; today that same rate is around 3.5%. Veterans can reuse their VA benefit to streamline refinance an existing VA loan, often with no money out of pocket. On these streamline refinance loans, VA requires no appraisal and no credit underwriting, which can be of great assistance to Veterans who may have suffered a minor credit setback, or whose home values may have declined during these past few years. Last year, a streamline refinance decreased the average Veteran’s interest rate 1.4%, and saved $202 a month in mortgage payments. Cumulatively, our Veteran borrowers saved over $300M last year! For Veterans with FHA or conventional loans, VA can also assist with the ‘regular’ refinance program. Since VA does not charge borrowers upfront or monthly mortgage insurance premiums, refinancing from an FHA loan into a VA loan can save Veteran borrowers a significant amount of money. We encourage Veterans to seek the advice of a financial professional to determine what mortgage decisions are in their best interest, but wanted you to know that the VA Home Loan program stands ever-ready to serve them, providing the opportunity to purchase or refinance a home. In addition, VA stands ready to assist Veterans who have already obtained a VA home loan. If you already have a VA loan and are facing financial difficulty, please call to speak to VA loan representatives at 877-827-3702. In FY16, of all loans that defaulted, 84% were saved from foreclosure. Every day—but particularly on Veterans Day—Social Security salutes those who have put their lives on the line for our freedom. Members of the United States armed forces receive expedited processing of their Social Security disability applications. The expedited process is available for any military service member who alleges he or she became disabled during active duty on or after October 1, 2001, regardless of where the disability occurred—at home or in the line of duty. Expedited processing is also available to veterans who have a compensation rating of 100% Permanent and Total (P&T) disability, regardless of when the disability occurred. Some dependent children and spouses of military personnel may also be eligible to receive benefits. Visit our website designed specifically for our wounded veterans, www.socialsecurity.gov/woundedwarriors, where you will find answers to a number of commonly asked questions, as well as other useful information about disability benefits available under the Social Security and Supplemental Security Income (SSI) programs. Our website includes a fact sheet on the subject: Disability Benefits For Wounded Warriors. You’ll also find a webinar, “Social Security for Wounded Warriors,” that explains the expedited disability process available to wounded warriors. The one-hour video is an introduction to disability benefits for veterans and active duty military personnel. If you would like more detailed information about the disability process, you can watch our seven-part video series “Social Security Disability Claims Process” at www.socialsecurity.gov/socialmedia/webinars. On the Wounded Warriors webpage, you’ll find links to the Department of Veterans Affairs and Department of Defense websites. Please keep in mind that the requirements for disability benefits available through Social Security are different from those of the Department of Veterans Affairs and require a separate application. Military service members are covered for the same Social Security survivors, disability, and retirement benefits as everyone else. Although the expedited service is relatively new, military personnel have been covered under Social Security since 1957, and people who were in the service prior to that may be able to get special credit for some of their service. Read our publication, Military Service and Social Security, to learn more. It’s available at socialsecurity.gov/. Also, navigate to Wounded Warriors. Find discounts offered by local businesses in Union County to all veterans. As more retailers offer veteran discounts, we will post them. Please contact the retailer for more details. To add your local business’s discounts, click here. The County of Union has been made aware that the Federal Government has temporarily put a hold on creating new Vet ID card applications due to a large volume of requests. Please visit their website to provide your email address to receive updates regarding the application process. Is presumed by VA to be related to military service. To receive disability compensation, you must have been discharged under other than dishonorable conditions. Learn more about this on the federal government’s Social Security website. Union County Paratransit offers transportation for Union County’s veterans at a fee of $2.00 for a one-way trip and $4.00 for a round trip. Appointments for rides must be made in advance by calling the Paratransit scheduling office at 908-241-8300. Call Monday through Friday 7:00 a.m. to 4:30 p.m. Try to schedule appointments between 10:00 a.m. & 1:00 p.m. The Paratransit system offers curb- to-curb service only. Assistance may be provided by an aide traveling with the veteran. VA pays benefits to eligible Servicemembers and Veterans pursuing an approved education or training program. There are four primary VA education benefit programs that cover Active Duty, National Guard, and Reserve Servicemembers and Veterans: Post-9/11 GI Bill (Chapter 33) | Montgomery GI Bill-Active Duty (Chapter 30) | Montgomery GI Bill-Selected Reserve (Chapter 1606) | Reserve Educational Assistance Program (REAP). The Post-9/11 GI Bill program provides financial assistance towards tuition and fees, books, and supplies, and it provides a monthly housing allowance. Eligible Service Members may transfer unused Post-9/11 GI Bill benefits to an eligible spouse or child. VA pays a monthly allowance under the other benefit programs to help offset educational costs. Information about VA education programs can be found at www.gibill.va.gov. These classes and workshops are offered free of charge to our veterans and their families. All programs begin at 6:30 PM and will be held at the Cranford VFW, 479 South Ave., Cranford, NJ 07016. View the list of classes and workshops. 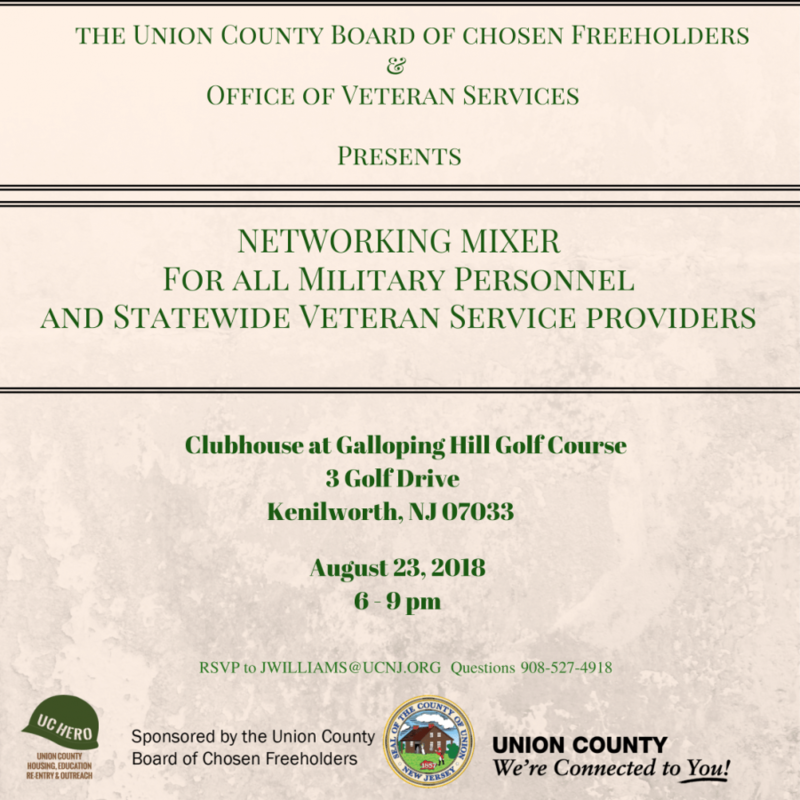 The Union County One-Stop offices have representatives their specifically to help Veterans. The state has instructed both representatives that they are only to see disabled vets and by appointment only. Other state interviewers/counselors should be available to see all non disabled vets for job placement. Feds Hire Vets In partnership with the Departments of Defense, Labor, Veterans Affairs, Homeland Security, and other Federal agencies, our vision is that this Website will be the preeminent source for Federal employment information for our Veterans, transitioning service members, their families, Federal HR professionals and hiring managers. Our goal is to provide consistent and accurate information and useful training and other resources in a way that will inform both the applicant and the hiring agency. Qualified war veterans and their unmarried surviving spouses/partners are eligible for a real estate property tax deduction of up to $250 and must contact their municipal tax office to apply. Disabled war veterans (100% totally and permanently disabled) and their surviving unmarried spouses/partners may be exempt from real estate property taxes on their principal residence. The surviving spouses/partners of military members who died in wartime active duty may also qualify. The local municipal tax office will handle this application. Full Real Estate Tax Exemption – New Jersey’s Constitution and Tax Laws provide that certain totally and permanently disabled war veterans or the surviving spouses of such disabled war veterans or the surviving spouses of service persons who died on wartime active duty be exempt from real estate taxes on their principal residence and the lot on which that residence is situated. To qualify for a real estate tax exemption as a veteran, you must be honorably discharged from active wartime service in the US Armed Forces and be VA certified as having service-connected total or 100% permanent disability. You must be the full owner of and a permanent resident in the dwelling house for which exemption is claimed and a legal or domiciliary resident of New Jersey. Timely application must be made with the municipal assessor of the taxing district where your home is currently located. As a surviving spouse of a disabled veteran who met all of the above eligibility requirements you, yourself, must not have remarried, must also be a New Jersey resident and owner – occupant of the claimed dwelling. Out-of-State residents and tenant occupants of rental dwellings are not eligible for real estate tax exemption or retroactive refunds. Instructions for Claiming Exemption with Local Municipality – Please review the above section on Full Real Estate Tax Exemption to see if you meet the basic eligibility requirements. If you think you meet the basic criteria and have never applied for exemption, please obtain initial application Form D.V.S.S.E. from your municipal assessor and file it with the assessor as soon as possible. When a veteran passes away, the Union County Office of Veterans’ Affairs will help in obtaining the following VA benefits: headstone and markers, burial flags, reimbursement of burial expenses and burial in VA National Cemetery. VA covers the cost of headstones/burials in VA cemeteries, and costs are not covered in private cemeteries. We are here to help you file all of the necessary paperwork to ensure you receive the benefits you deserve.